We hope you have been enjoying the our beautiful Park this summer. through September. The last market will be October 12. This month instead of a meeting we invite you all to a special event. You can RSVP and invite your friends on Facebook. Please like our page. Barefoot Wine is teaming up with the Alliance for the Great Lakes and South Shore Park Watch to host a public Adopt-a-Beach™ cleanup at South Shore Beach. Following the cleanup, volunteer’s ages 21 and older are invited to attend a celebration featuring Barefoot Wine and surf-inspired fare at Horny Goat Hideaway! Lake side of the Pavilion 2011 S. First St.
WHO: Barefoot Wine: fun, flavorful and affordable wines and bubblies. Alliance for the Great Lakes: a nonprofit organization with the mission of conserving and restoring the world’s largest freshwater resource using policy, education and local efforts, ensuring a healthy Great Lakes and clean water for generations of people and wildlife. South Shore Park Watch: was organized in 1996 by area residents concerned about water quality, park maintenance and security, lakeshore erosion, and other issues that might threaten the health of South Shore Park as an outstanding community resource. University of Wisconsin Sea Grant: is a statewide program of basic and applied research, education, and outreach and technology transfer dedicated to the stewardship and sustainable use of the nation’s Great Lakes and ocean resources. Here is an Update from the parks for our canine friends. 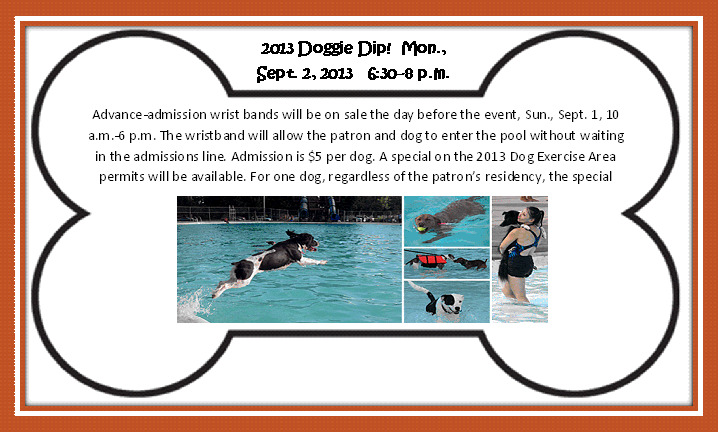 Due to the popularity of the Doggie Dip, you can buy your admission the day before the dip. You will receive a wrist band that allows you to enter the pool without waiting in the admissions line. 10 a.m.-6 p.m. Admission PRE-SALE Cool Waters in Greenfield Park, 2028 S. 124th St.
6:30–8 p.m. Doggie Dip! Cool Waters in Greenfield Park, 2028 S. 124th St. In case of inclement weather, call the Cool Waters Hotline at (414) 257-8089.